The recent wars in Afghanistan and Iraq have focused public attention on ambushes, but this is not a new problem. The Irish Revolution (1916-1923) was a war of 'firsts': the British counterinsurgency after World War I; the first mass use of motorised vehicles for counterinsurgency; the first use of extensive countermobility operations by insurgents; the first time a military force had to 'up-armour' its motor vehicles in response to the insurgent threat; the first time they had to deal with the negative effects of hanging steel plate on cars and trucks; the use of improvised explosive devices (IEDs) against motor vehicles-in both forms of pressure detonation and command (electric) detonation; the first time an army had to develop doctrine for the use of motor vehicles in a tactical or combat mode. Thus, the IRA exploited the axiom that military forces are at their most vulnerable when on the move. 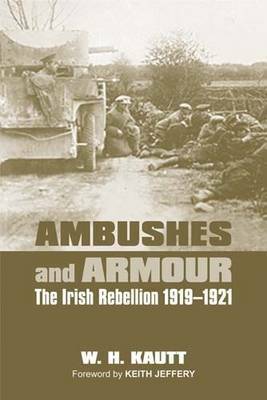 This study focuses on the last of the 'firsts', the development of ambush and counter-ambush doctrine, for in examining how the British forces (army, RIC, ADRIC) learned to counter these threats, the story of the other 'firsts' comes out too. By disregarding the politics and social issues, as much as possible without losing context and perspective, the focus is on the military aspects of these operations. Further, the examination of the tactics, rather than the strategies, reveal truths about how the opposing forces functioned 'on the ground'.